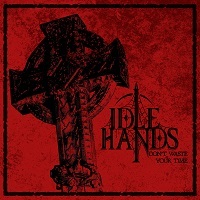 Portland, Oregon’s IDLE HANDS are a band that can be described as a fusion of Traditional Metal, Goth, New Wave and maybe a smidgen of NWOBHM. The cite influences ranging from SISTERS OF MERCY and DEPECHE MODE to IRON MAIDEN and ACCEPT. If that seems like a lot to take in, that’s exactly what I was thinking. I wasn’t really sure of what to expect, so I simply dove in. I was presented with an EP release titled “Don’t Waste your Time” on Lone Fir Records. Now, either somebody didn’t think this title through all the way, or this band has balls of steel and plenty of confidence to go around. By my assessment, the answer is somewhere in the middle. IDLE HANDS has quite a following in the Pacific Northwest, and for good reason. IDLE HANDS is a phoenix rising from the ashes of SPELLCASTER, and features Gabe Franco, Sebastian Silva and Colin Vranizan from that roster. Franco has traded his bass for guitar and vocals, and added David Kimbro to fill that void on bass. There is a tremendous amount of originality here, and that needs to be appreciated. The genres these guys have thrown together are definitely unique, and perhaps surprisingly, mesh well together. The EP opens with “Blade and the Will”, and initially, this sounds very 80’s Metalish. While that theme remains underlying throughout, once Franco’s vocals begin the influences of SISTERS OF MERCY and DEPECHE MODE and the like become the prominent theme. The dual guitar approach almost at times seems to take on an 80’s keyboards vibe. It’s kind of strange, but still, it really works. Next, we have “By Way of Kingdom”, and this one definitely features some uncredited keyboards. Again, it works. It’s a good song, featuring some ripping guitar work from Silva. But at this point the EP’s weakness really begins to become apparent. Franco’s vocals really have zero range. I like them to a degree, but at times they seem monotonous, and really hold the potential of the songs back, at least for me. The styling of the vocals are really trying to channel that 80’s sound, and at times that’s great. But at other times they just distract. Maybe, just some more time at the microphone will get things to where they need to be. “Can You Hear the Rain” is the standout track for me. It’s a slower pace song, and really showcases the originality of what the band is attempting to do. “Time Crushes All” begins and ends with a clock ticking and in-between features some of my favorite guitar work. Closing this one out is “I Feel Nothing”. Again the guitar work is on point here. Great crunchy riff and lots of fuzz, and Silva continues to impress with his solos. I’ve not heard anything like this before, so I really commend IDLE HANDS for doing something totally unique. I’m interested to see how this EP is received overall, and immensely curious about the full length the band is targeting.